Scott Fernandez, president of E.K. 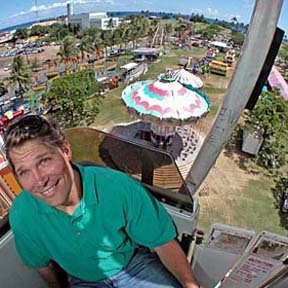 Fernandez Shows, got a Ferris wheel's view of Kakaako Waterfront Park yesterday. The Kakaako Carnival and Food Festival opens tonight from 6 p.m. to midnight, from noon to midnight tomorrow and from noon to 10 p.m. Sunday.